It has been an interesting week, hence no blogging. TGFL (Thank God For Lori!) I’ve missed you all. Speaking of the wedding, my brother-in-law Rich and new sister-in-law Mel pulled off a FAB-U-LOUS affair. We had a great time. The only thing missing was Mel’s mom’s chocolate shots! The wedding libations are a story for another day though. Two words: flaming shots. I’ll do some wedding posts soon. In other exciting news, Whit defended her thesis successfully and officially has her Master’s Degree in Psychology next month. Thrifty Nana (my mom), Dad, Mom Connie and I took the girls to the MN State Fair – a zoo of 250,000 people – let’s just say I fulfilled my month’s quota of artery clog with the deep fried Milky Way candy bar on a stick. And the whole wedding party gathered again for a Twins game at Target Field on Monday. Thanks JE and WE for that! Everything was great. Which should’ve been a sign. I managed pretty well with the general schedule, and there were no extraordinary tantrums...till Wednesday when Thrifty Nana called to inform me that Easy Mac had tripped and nearly knocked her eye tooth out. I called the dentist immediately and thankfully he was able to wait after hours so we could have it looked at. “It’s really wobbling in there,” he said. Cripes. “Come back tomorrow so we can take an x-ray and look at it without all the blood.” Thankfully Thrifty Nana was able to do that. Thursday morning, I got a prompt on my phone that software needed updating and did I want to do that? Sure. I touched yes and all hell broke loose. Turns out software updates on Verizon/HTC smart phones mean it erases the phone completely back to factory settings. Not even Verizon customer service (who were nice and timely) could do a thing about it. I used up nearly all the battery trying to get it set up again to make phone calls and texts. This was no good since I needed to make phone calls and texts. The dentist called numerous times wanting to know how many extraordinary measures I wanted to take to save Easy Mac’s tooth. In other words, how much $$$. Shaun said he didn’t want to spend $10,000; I said I’d be willing to spend $3,000 since evidently the permanent eye tooth isn’t supposed to come in until kids are 9 years old (or so) and having no baby tooth there that long can damage the enamel on the permanent tooth. Well, thankfully post x-ray Dr. P says we are still in the “ballgame” for saving her tooth. The root isn’t broken and it’s not quite as jiggly. The nerves might have severed so the tooth could stay in but might die and turn darker. Well, you win some and you lose some. 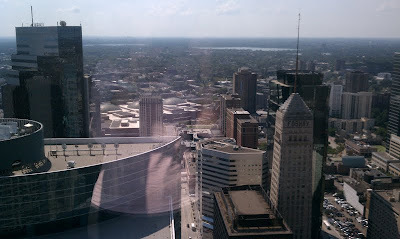 All while this dental drama was going on Thursday I was in the Capella Tower in downtown big city, MN, on the 43rd floor for a meeting. 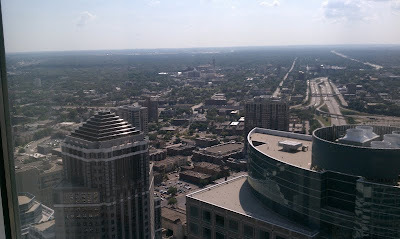 It’s one of the tallest buildings downtown. It was a beautiful day and the sky was clear. I could see for miles. I took these pictures and thought to myself, ‘Ethne, step back a minute and look at how beautiful life is.’ Honestly. Only after-the-fact and as I write this did it strike me that as high as I was in that tower, I wasn’t even halfway as high as the 110 stories tall the World Trade Towers were. 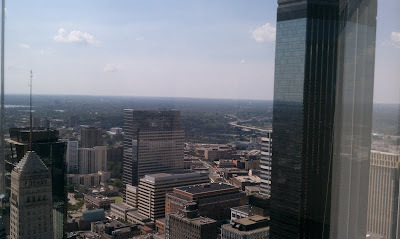 I thought of how long the banks of elevators took me to get up to floor 43. Imagine how it would be walking down the narrow steps of those towers amid the smoke and fire and horror. Life is sometimes ugly. Thank you to the Servicemen and Women who served our country that day and ever since as we’ve fought the terrorists who attacked our country that day. And we certainly won't forget those who died that day. Anyway, Thursday night we went to Pre-School open house for the girls to meet their teachers. What?!?!?! How is it possible my little preemies are now in school? I must be hallucinating. Thankfully TN and Grandpa & Grandma D were able to go with us since Shaun was away. My girls will be all grown in a heartbeat and I need to take mental snapshots of these events as they are fleeting. So life was crazy. But crazy as it was, life is beautiful too. I am proud of myself for taking a step back and thinking of that in the middle of the nutty week I had. Friends, we hope you are all well and thinking in memoriam of those who passed that day ten years ago, and those who have served and sacrificed for our country since. Every once in a while, take a step back and look at life’s little beautiful things too. The beauty far outweighs the ugly, even if you have to look for it.